Scientists have called for Kyrgyzstan's only mummy to be immediately dug back up after the 1,500-year-old relic was taken from a museum and hastily reburied on the eve of a presidential election in a decision celebrated by self-professed psychics. The female mummy was put back in the ground in mid-October in the same dusty corner of southern Kyrgyzstan where it was discovered in 1956 after a sudden ruling by a state commission. The decision was made despite strong opposition from the only archaeologist on the commission and culture minister Tugelbai Kazakov, who played the decisive role in the call, resigned on Saturday. Kazakov said the mummy had been largely neglected by scientists and the country lacked the finances to keep it in good condition. But some have said the timing of the reburial -- on the eve of a bitterly fought presidential election -- indicates the influence of superstitions that have gripped the Central Asian country's turbulent politics in the past. The reburial decision was celebrated by self-styled psychics in the Muslim-majority state, who had warned that disaster loomed if the mummy remained vacuum-packed in a state museum. Self-described medium Zamira Muratbekova claimed she received a message from the spiritual world commanding authorities to rebury the mummy. "She never died," Muratbekova told AFP. "When they first found her she was still alive. She was like a sleeping girl." "By reburying her we saved ourselves from bloodletting at the election," she said, adding that heeding scientists' calls to re-exhume the body would be a grave mistake. "Before, the spirits spoke to us in terms of suggestions, but now they are giving us orders." Kadycha Tashbayeva, the country's head archaeologist who sat on the commission, indicated the decision may have been influenced by the advice of psychics. "You would think these people are just cultists and marginals. But they talk, and then the state echoes their position," Tashbayeva said. While Islam is the main religion in Kyrgyzstan, shamanic practices and cultural superstition also have deep roots in the former Soviet country of six million people. In 2011, lawmakers ritually slaughtered seven sheep in parliament to exorcise "evil spirits". Outgoing President Almazbek Atambayev has condemned the mummy's reburial, blaming "pseudo-Muslims" who "believe every clairvoyant". But a lawmaker in Atambayev's dominant Social Democratic Party, who is part of a parliamentary commission that has been formed to determine the mummy's fate following the burial, is against digging the body back up. "Is she Kyrgyz? Is she Muslim? We don't know anything of this mummy!" said lawmaker Ryskeldi Mombekov of the relic, whose death almost certainly predates the birth of Islam. "Re-excavating her again would amount to vandalism," he said during a tense session of the legislature earlier this month. 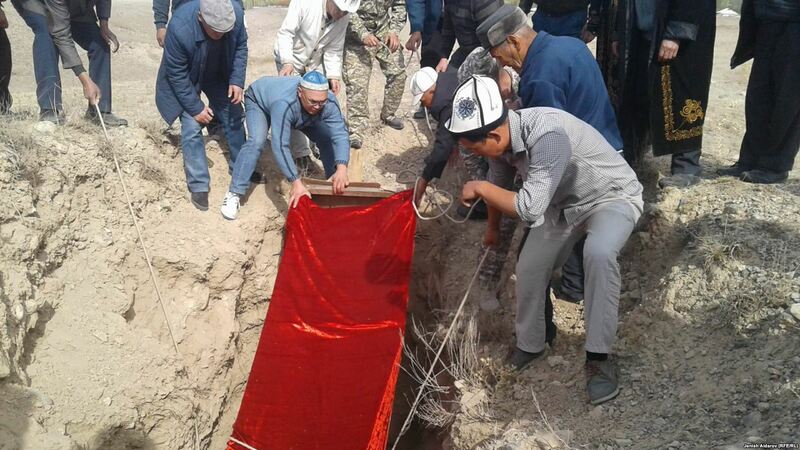 Archaeologists from Kyrgyzstan and around the world condemned the reburial as a backwards step for science. "Exhume the mummy and put it back in a sealed chamber in the museum immediately," Victor Mair, a professor in the Chinese language and literature department at the University of Pennsylvania, told AFP. Mair is among a small group of foreign academics that have studied the so-called Tarim mummies, hundreds of which were discovered in the autonomous Xinjiang region of China that borders Kyrgyzstan. Archaeologists believe these mummies, which are preserved due to harsh climatic conditions rather than the mummification customs associated with ancient Egypt, are key to understanding historical migration patterns in the region. Mair said the Kyrgyzstan mummy "has tremendous value in filling in the gap" as a case study between Xinjiang's Tarim Basin and Western Eurasia. One of the official justifications for the reburial provided by former culture minister Kazakov was that the mummy was "just an ordinary woman", unlike Soviet founder Vladimir Lenin, who he said was a "chieftain" worthy of preservation. Archaeologist Tashbayeva rejected both these arguments and said important facts about the mummy are already known. "Her gender is known, we know she was quite young -- probably less than 30 -- when she died," she said. "We can see that her skull has undergone artificial deformation, which was a popular custom among nomads of our region and era. "We could learn even more with DNA testing but we lack specialists," she added. Tashbayeva and her colleagues have refused to share a stage with self-professed psychics as local television shows have jumped on the topic. She accused the mediums of filling the debate with "nonsense". "I am worried we are destined for a dark age," she said.